Buying a mast can be confusing. Here we aim to simplify things, give advice, and outline the science behind mast bend curves, response, and construction. Our objective is to help you choose the right mast – enabling you to maximise value, and enjoy your ride for several seasons of performance and durability. The first thing to know about mast choice is that it is important! If there’s one area you don’t want to scrimp and save on, it’s picking the right masts for your sails. Of course, fins are pretty critical too, as are boards and sails, but a badly matched mast will ruin your day - no matter the rest of your gear. But, once you’ve spent your money, you can relax knowing you’ve got the best tool for the job. Trust us. Get it right first time and you’ll enjoy amazing, long-lasting value for money from your mast. And not have to worry about trading them in/up for the latest model each year. Also, although we hope you enjoy reading this, we recommend you always go to your local dealer for expert advice and service. They’ve experience of many hundreds of sails and masts, and can study your quiver to guarantee you’ll leave with the right model for you. A vital aspect of optimum sail trim is the mast you choose - in combination with the correct downhaul and outhaul. In this respect it’s considered good practice to follow the mast type and length recommendation of the sail manufacturer. These recommendations are based on an average weight of the rider. Sometimes more mast length options are provided or available. So, first, compare the numbers - as explained below - of your current mast with those that your sails recommend. As a general rule, the sail manufacturer’s own recommended mast will be the best choice, as this will be that one that was used to develop the sail. But you may also consider buying an independent brand (yes, such as Unifiber!) to match multiple sails in your existing or future quiver. However, there are variances from mast to mast (and Unifiber masts also have some small variations too) so the masts seen in our MAST SELECTOR are based on the averages from all the brands we’ve measured over the past seasons. You can never record enough data, but we’ve measured a lot (!) meaning we and our long-standing store customers are confident we’ve got a solid overview in our mast selector guide. First, let’s look at Carbon Content. HOW MUCH CARBON CONTENT IS BEST? Most masts have a carbon content that varies between 30% and 100%. The higher the carbon content the more responsive and crisp your rig will feel. Also a higher content results in a lower weight with more control from the reduced inertia. Most masts use a mix of carbon fibre and glass-fibre in their construction, so '100% carbon' refers to a mast that uses exclusively carbon fibre. But even in a 100% carbon mast, other materials - most notably epoxy resin - will be present. Lower carbon content masts are cheaper, but also heavier, less responsive, and can feel 'dead'. Assuming similar bend characteristics, sails will always perform better on higher percentage models. But for strength, and especially use in waves, 80% can be a good mix for durability and performance. Another issue to bear in mind for maximizing durability, especially in surf, is to consider sails with a less extreme luff curve, so the mast is under less tension to start with. The Bend Curve represents the shape of your mast under load. As we normally use conical-shaped masts (wider at bottom than top) the mast top bends a lot more than the bottom under load. So, the Bend Curve describes the difference in bend between the top and bottom part of your mast. The IMCS mast stiffness is related to how your mast bends under load. A lower IMCS indicates a more flexible, or 'softer' mast. Normally the Bend Curve value is rated between 6 and 20. 20 for a very high bending (flexible) top and 6 for a very low bending (stiff) top. Most mast manufacturers adhere to the more or less normalized mast length-related stiffness. E.g., 400 masts are often rated at 19 IMCS, 430s as 21, 460s as 25 and 490s at 29. Hence longer masts are normally stiffer than shorter masts. 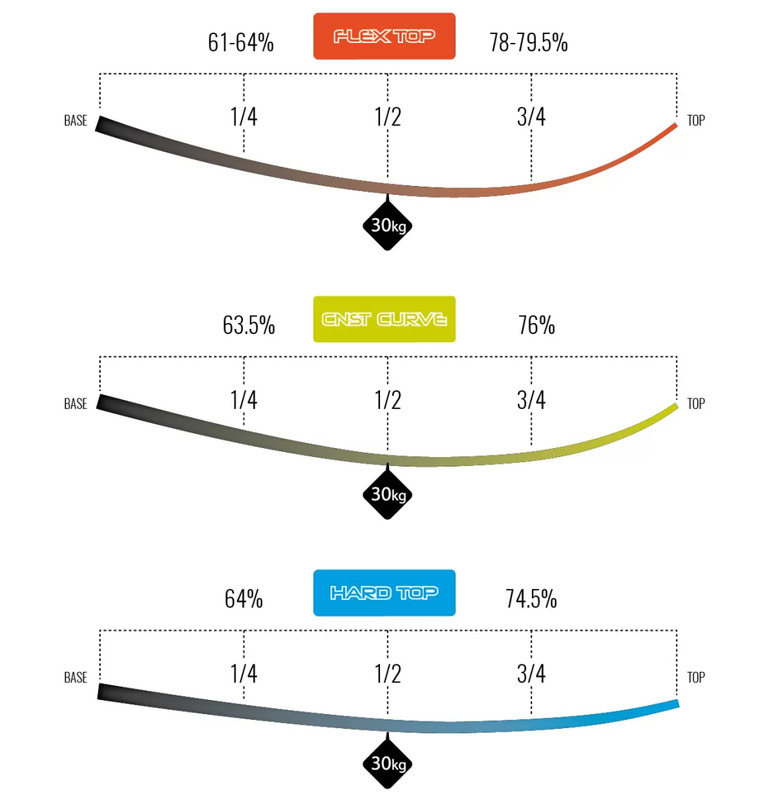 Unifiber also follows the above IMCS values per given mast length. Flex top (also known as soft-top) masts are built differently to hard-top (aka stiff-top) masts. Differences in bend curve are achieved by adjusting the orientation of the structural carbon/glass fibres, and by subtle adjustment of mast diameter in the top section. Soft-top masts are not weaker, as they have more flex and forgiveness under stress. In terms of durability any differences between hard and soft top are negligible. Changing the stiffness and or Bend Curve of masts is possible in a number of ways. For example, by extending the top or bottom of the mast; or even cutting the mast. Also, sometimes, mixing different bases and tops is possible, often with considerable influence on both the Bend Curve and IMCS. But this isn't necessarily possible on all brands, and is not intentionally possible or recommended for Unifiber. Extend the bottom section part of a shorter mast with 30cm extra extension. For example, a 430 mast with 30cm extension becomes a 460. The result will be a 460 mast with the stiffness of the 430 mast. The stiffness characteristic will be as per the 430, but slightly stiffer (approximately plus 1 on the IMCS). The Bend Curve will be as per the 430, but slightly more flex-top (around plus 0.5 on Bend Curve). Understanding the above and knowing your mast will help you to improve your sailing performance and have more fun on the water. Not enough Science for you? Well, read on and we’ll tell you how we test various sail brands’ masts with our own specially-built machine. 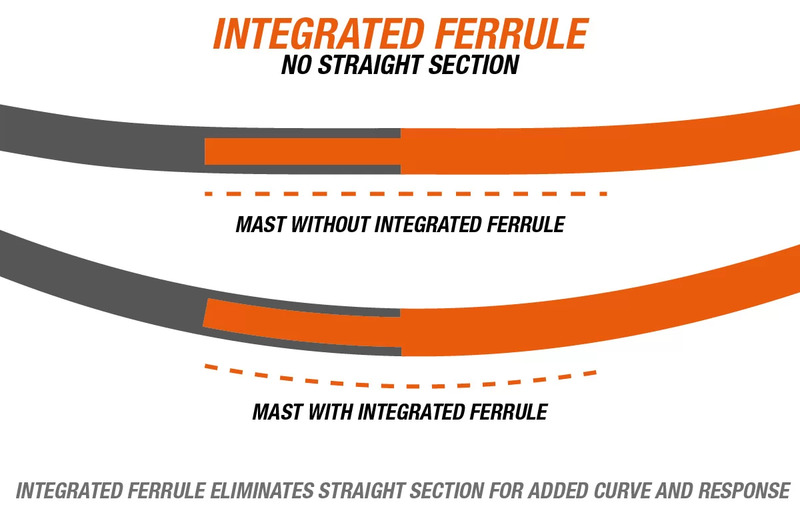 The Bend Curve (BC) and IMCS stiffness can be determined via the commonly used IMCS mast measurement method. This is calculated by hanging a 30kg dead weight at the mast’s midpoint and measuring the mast deflection at 1/4, 1/2 and 3/4 of its length. Let's call the deflection at 1/2 the total deflection. Now, calculate the top section (3/4 length) deflection as a percentage of the total deflection, and also the bottom section (1/4 length) deflection as a percentage of total deflection. Subtract the top section result from the bottom section result and you get the Bend Curve figure. Most masts are between 6 - for a very low bending (stiff) top, and 20 - for a very high bending (flexible) top. Stiffness will be determined through midpoint deflection, by a standard formula. It should be noted that particular sail manufacturers may use alternative or proprietary Bend Curve measurement methods. Unifiber mast selector, below, provides information on masts offered by sail brands. To enable easier comparison masts are categorized as Hard Top, Constant curve or Flex top. See below for the calculation method and a few typical mid-deflection figures (30kg load). For the ‘length’ we normally use standard lengths (e.g., 400, 430, 460...). Length and mid-deflection are measured in centimetres. Mid-deflection is with a 30kg load. Adhering to this accepted measurement method enables easy transfer of results and comparisons with other tests. Our measurement set-up enables a measurement resolution of +/- 0,1 IMCS points and about +/- 0,25 Bend Curve points. Absolute measurement accuracy is very hard to determine because no reference mast can be obtained. In the event that you are interested in details of above measuring method, or in building your own measuring set up, please contact Unifiber. Unifiber started a few years ago to measure and collect mast data from practically all known mast / sail manufacturers. To enable a reliable outcome we measured a number of masts of the same type and length. We learned that production tolerances are seldom below 1 BC and/or IMCS point. Notwithstanding these production tolerances, we've seen an overall trend from hard-top masts towards constant curve masts for some race sails. We started testing masts in 2011. Check our latest Masts Selector, where you will also be able to click through to previous versions.